Glass Flowers and Leaves There are 15 products. CZ2093 - Purple tulip beads. Pack of 10. These are half coated, AB on one side. They have a pretty matt finish. Size 12 x 8mm. 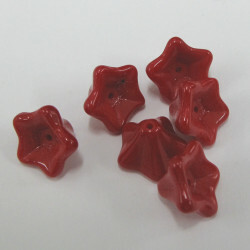 CZ3453 - Red glass flowers. Pack of 10. 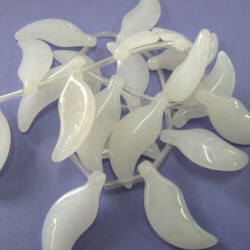 These are translucent with a 3 petal design. 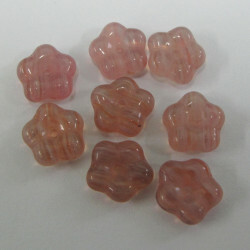 Approx 11 x 9 mm. 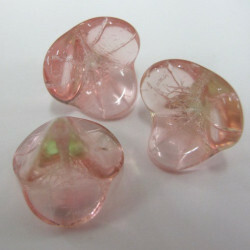 CZ3452 - Pink glass flower beads. Pack of 10. These have a subtle hint of a greeny gold which gives them a pretty vintage look. 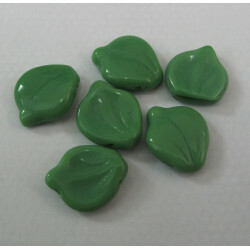 They are approx 16 x 12mm. Hole runs top to bottom. CZ2110 - Green Glass leaves. Pack of 10. 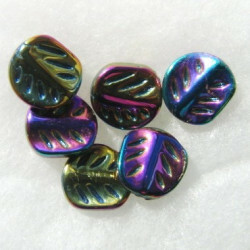 Glass leaf bead blue iris finish, pack of 10. 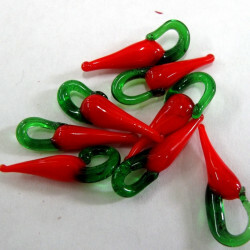 GB1748 - Red glass chilli. Pack of 10. Size varies as handmade, but in range 20- 27mm from top to bottom. Red glass flowers. Pack of 10. Pretty beads with a hole that runs up and down. 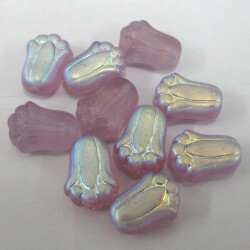 Approx 12mm x 10mm. 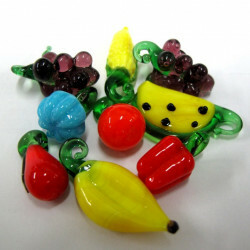 Glass fruit mix. 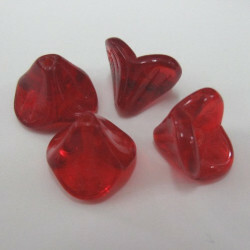 Pack of 10 pieces. GB1749 - Glass fruit mix. Pack of 10 pieces. These are various sizes, largest about 34mm, smallest about 16mm. All have glass top loop. 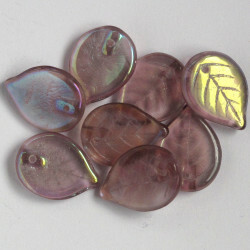 Czech Glass Leaf, Lilac Coloured with AB Coating, Approx. 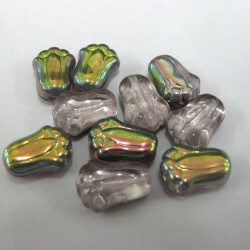 18mm by 14mm, Pack of 10. CZ2095 - Tulip bead, pinky vitral. Pack of 10. These are a hard colour to categorize. One side is a pinky/greeny rainbow, the other a pale rosaline. They are certainly very pretty. 12 x 8mm. Small pink glass flowers. Pack of 20. Approx 8mm diameter x 3mm deep. They have an attractive slightly stripey effect.